There are so many wonderful granola recipes all over the internet, cookbooks, and magazines these days. I found one a few years ago that I have adapted time and time again, it’s that good. I feel like it has become my own, in that I have memorized it, I make it a lot, I add and subtract ingredients, or make it with what I have on hand. In the last few months, really since the holidays, I have not made granola *gasp*. It’s ok, everyone suffered this calamity, especially Brian’s co-workers. There are a couple of things that make their way to his office from time to time, granola is one of those things. So when Brian told me one of his co-workers would no longer work at his office, I knew what I had to do. So I got to making a huge batch of this granola to send him off to his new job full of happy granola. And I wrote, ” Happy Trails” on the bag, I crack myself up. Toasted Almonds: Place almonds on a baking sheet, place in oven at 350 degrees for about 10 minutes or golden brown. Remove and allow to cool. Toasted Coconut: Place coconut flakes on baking sheet, place in oven at 350 degrees for about 10 minutes or golden brown. Remove and allow to cool. 1. In a large bowl add the oats, cardamom, cinnamon, and salt. Stir to combine well. In a medium bowl add the honey, olive oil, and vanilla. Stir to combine. Add the liquid to the oats mixture. Using a spatula or your hands, mix well. 2. 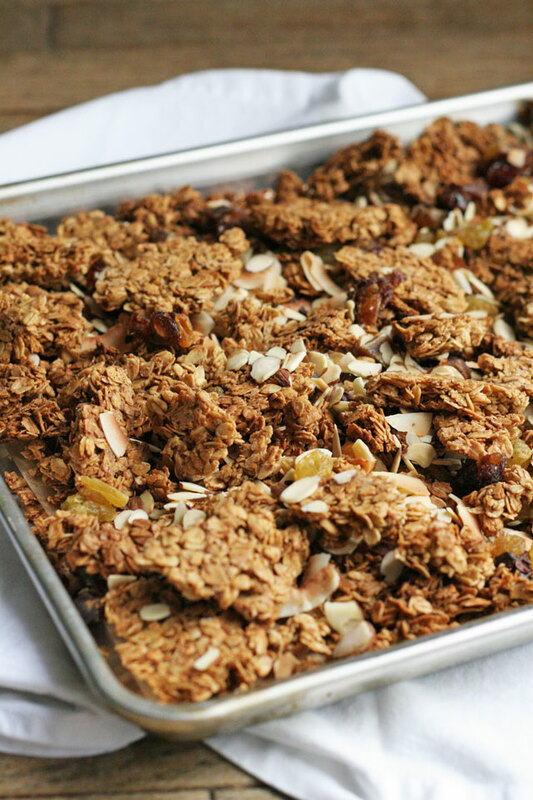 Place the oat mixture on a parchment lined baking sheet. Spread evenly, and press down lightly to compact the mixture. This creates larger chunks after baking. Place in oven and bake for 30-40 minutes, until golden brown. 3. While the granola is baking add the toasted almonds, dates, raisins, toasted coconut, and cacao nibs to a large bowl, mix to combine. 4. 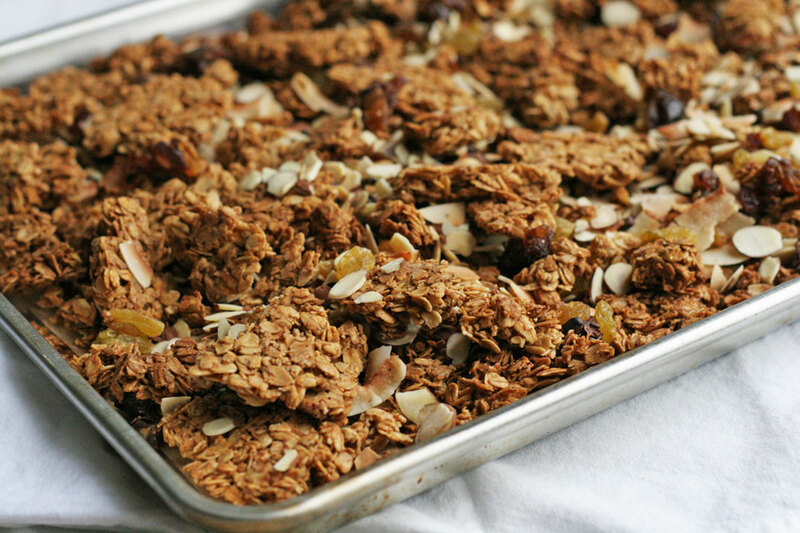 Remove baked granola from the oven, allow to cool for 20 minutes. 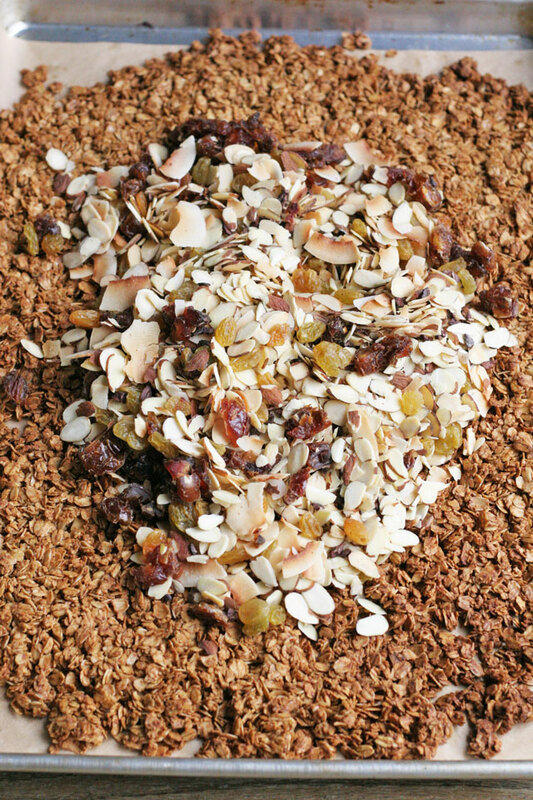 Once cooled, place the granola in a large bowl and add the nut fruit mixture. Break apart the granola into medium chunks, easy for snacking. I so need to make it more often as well. Thank you!